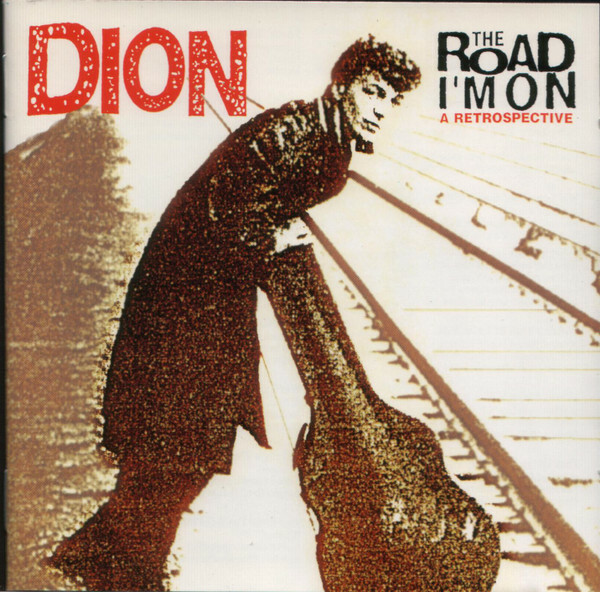 Dion - The Road I'm On, A Retrospective (Legacy, 1997). A 2 CD overview of this amazing singer. Dion DiMucci has got to be one of the most exciting singers to have emerged from New York City, and a talented songwriter in his own right. He is King of the New York streets, a singular talent who had tremendous success with doo wop, then made the bold transition to folk and blues as he got further into his solo career, having honed his skills in harmony groups Del Satins and Belmonts. He stayed with Laurie Records for a while after having left Belmonts in 1960, then signed with Columbia Records in 1962, the first rock and roll artist to do so on that label. Mitch Miller did A&R for Columbia at that time and he hated rock and roll with a passion, so Dion only found his feet on that label when he was introduced to blues by producer John Hammond in 1965. By then his star was fading a bit, and he was mired in heroin addiction. Nevertheless, Dion's stint at Columbia showed an artist who was reinventing himself, becoming more reflective, with intimate and revelatory explorations in folk and blues. It's all here on this set, the pop, the folk, and the blues. Of the 35 tracks on this 2CD, a dozen are previously unreleased and a few more are first-time stereo re-issues. Top marks all around. It's too bad our former Dion top-fan GuyE isn't here to comment. No matter whatever else Dion made, Runaround Sue and The Wanderer are rock and roll standouts. In a way, no matter how "relevant" his songs like Abraham, Martin and John" were, there seems to have been a overly desperate cry saying, "I'm hip, too!" Not that that was unusual back then, 50s artists catching up to what was happening in the 60s, i.e., Neil Sedaka. And then the reverse with bands like Sha Na Na. Jimbo wrote: It's too bad our former Dion top-fan GuyE isn't here to comment. Dion was always hip - one of the hard lads, rose from the street. He was caught up in the teen idol thing briefly, but the move to Columbia and what followed, he had nothing left to prove. Bobby Darin was another case of a star who got labeled teen idol, but he was so much more. There were so many Bobby's charting in the early 60s, it caused some confusion. Bobby Darin was an amazing talent, as was Dion but they nonetheless made better cabaret artists than Fillmore East artists which they aspired to be as the 60s hippie movement took hold - along (probably) with the weed, acid and junk. With Phil Spector in the mid-seventies.